Yesterday at SMX East on the panel with both Google and Bing, there was an open Q&A for the search engines and SEOs who were on that panel. But both Bing and Google had fun personalities up, Bing had Vincent Wehren, the Lead Program Manager for Bing Webmaster Tools and Google had Gary Illyes, Webmaster Trends Analyst and Search Quality Engineer. When Danny Sullivan asked Vincent from Bing if they will be adding a ranking boost for sites that go HTTPS, Vincent almost laughed. He said that Bing wants to "give searchers content they want" and if we brought HTTPS into that, it would mess around with the rankings based on no real relevancy factor. So no, they have no plans in the near or extended future to add HTTPS as a ranking factor. Google on the other hand feels otherwise and does say they have a boost for sites that go HTTPS. The good news is that if you do migrate to HTTPS, Bing seems to handle it just fine. I see in my analytics, no real change in traffic to my corporate site from Bing. 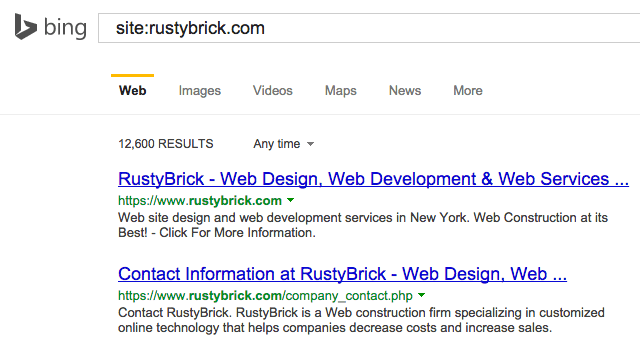 I also see Bing has indexed most, if not all, of my site in the HTTPS version and is ranking those pages first. So technically, you should be fine when migrating not just with Google, as I showed over here but also with Bing.